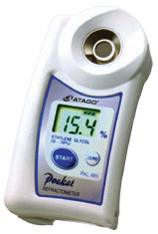 Digital Hand-Held “Pocket” Coolant Refractometer - The “Pocket” PAL-91S and PAL-92S coolant refractometers can easily measure the coolant concentration and other agents of Ethylene Glycol. Measured values are displayed digitally and the freezing point can also be measured and displayed. Digital Hand-Held “Pocket” Propylene Glycol Refractometer - The “Pocket” PAL-88S and PAL-89S Propylene glycol refractometers can easily measure the agent of Propylene Glycol. Digital Hand-Held “Pocket” Salinity (Sodium Chloride) Refractometer - The “Pocket” PAL-03S snow-melting agent (Nacl) refractometer can easily measure samples and display readings digitally. Light and compact, comfortable and easy to use design, allows for the portability and convenience to take measurements anywhere. Digital Hand-Held “Pocket” Wine Refractometer (Baume Scale) - The “Pocket” PAL-84S Wine refractometer can easily measure samples and display readings digitally. The PAL-S is great for fatty and dark samples! 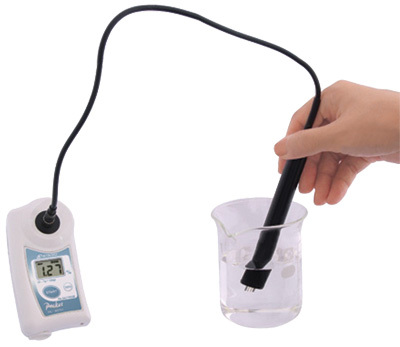 The unit even includes the MAGIC™ adaptor that cools down hot samples quickly and minimizes evaporation. Improved Repeatability with Mode S™ Technology. Mode S™ is the solution to fluctuating measurement values. Note: Complex or rich solutions such as sauces may benefit from dilution. Recommended dilution is 10% by weight; you may find a more optimal ratio for your sample.